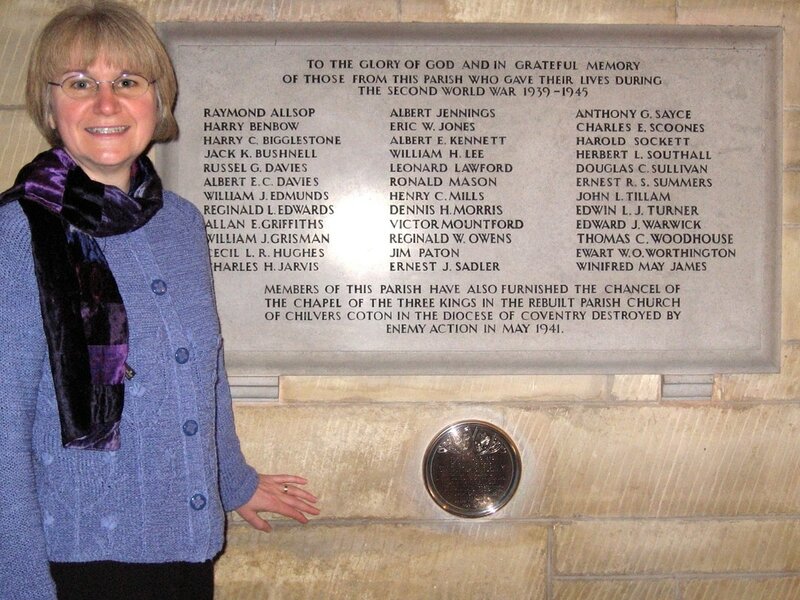 Faith Ford beside the memorial in St James Church. Raymond Allsop was a second lieutenant (217118) in the Royal Artillery (451 Battery, 47 Lt. A.A. Regt.) when he was killed on 26 March 1942 riding a motor cycle on active service while making a delivery. He was 25. Born in Manchester in 1917 Raymond was living in Hereford at the time of World War Two. His father, Frank, died in the trenches of the First World War before his birth. His mother Beatrice then married Herbert Wooldridge in 1919 and they lived in Park Street (104 Park Street, Lansdown Villa, renumbered to no 30 Park Street). His step niece informed me that Raymond was engaged to be married and serving on radar in this country when he died. He is buried in Hereford cemetery, Plot D. Grave 21. Muriel Munn, who lived in Park Street on the field side recalled Harry Benbow from Turner Street who was a similar age to her. Molly Hodges, who lived opposite Muriel and her sister Joan Clarke, also remembered Harry and thought he had a brother, Ron, and possibly was in the police force. The Graves Commission lists him as Henry Walter Benbow (Royal Artillery) who died on 27 November 1941 and is remembered in St Martin’s Cemetery, Hereford. William Jack Grisman from Portfield Street joined the RAF, but was captured when he bailed out of his plane after trying to make his way to a neutral port. He was imprisoned in Stalaft Luft III, and joined in the mass escape (portrayed in the 1963 film The Great Escape). He was executed on Hitler's orders after being recaptured. He is buried in Poland and there is a memorial to him at that site. The Graves Commission states that William died aged 29 on 6 June 1944. He was the son of William Charles and Gertrude Ellen Grisman, and husband of Marie Grisman. He is remembered at Poznan Old Garrison Cemetery in Poland. (I received an email on Christmas 2007 from his daughter, Judy Maidment, in Australia. Judy, a twin, was born when her father was in prison and so never knew her father. Her mother, Marie, remarried and moved to Australia. Charles H. Jarvis was the step brother of the grandfather of Sue Weaver of Park Street. Charles served in the Royal Artillery and died in 1942, aged 30. He is remembered at Hereford Cemetery. His mother, Flo and father William lived in Green Street. When William died Flo married Sue’s great grandfather, William Charles Parker (widower). Albert Jennings was remembered by Joan Clarke who was a little younger than her. He came from a large family (12 or 13 children) one of whom lived in Park Street until recently. Albert Edward Kennett, also recalled by Joan, lived near St Owen’s Gate. Born 1919 to Albert Thomas and Harriet Kennett, he served as a Private in the King’s Own Yorkshire Light Infantry, and died on 16 July 1944 and is remembered at St Manvieu War Cemetery, Cheux. Dennis Henry Morris was remembered by his sister, Dorothy, from Park Street. Their parents, William Henry and Annie Beatrice Morris, lived in Tupsley (Dennis was baptised at St Paul’s Church) before moving to St James in 1941 and Dennis attended St Paul’s School and St Owen’s before starting work at Hardings ironmongery shop (now the site of McDonalds) in Commercial Street. The 18-year-old was training as a carpenter when he was called up. He died of his injuries after the D Day allied landings during the Battle for Caen on 9 July 1944. He was 19 years old. He is buried at Cambes-en-Plaine War Cemetery. Dorothy Morris, who trained as a hairdresser, worked as a land girl at Matthews Dairy in Bartonsham. After the war she worked from home and cared for her mother who never recovered from losing her son, Dennis. Harold Sockett, born approximately 1916, was the son of Ernest and Elizabeth Sockett who lived in Turner Street. Before the war Harold worked at Thynne's Tile Works. Molly Hodges who also worked at the tile works told me that she remembered Harold. At the time of his death he was married with a daughter, Brenda. Harold joined the 2nd Battalion of the Herefordshire Regiment, but was later transferred to the Durham Light Infantry where he rose to Lance Corporal. The Graves Commission lists his parents and his wife, Alice, and that he is remembered at Groesbeek Memorial in The Netherlands. Harold died towards the end of the war (8 January 1945). Joan and Muriel also recalled Douglas Charles Sullivan, son of Albert Arthur and Lily Sullivan of Park Street (one of the houses set back from the road). Joan used to call for him every day on her way to St James’ School where they were both pupils. Douglas was 22-year-old sergeant in the RAF when he died on 3 October 1943. He is remembered at Reichswald Forest War Cemetery in Germany. John Lane Tillam’s parents, John and Annie Elsie Tillam, owned a butcher’s shop in St Owen’s Street (opposite The Barrels), a focal point for many local residents. Ella Levett recalls her mother going in the shop when the Tillam family learned that John was missing in action. Later they learned of his death. Molly Hodges told me that John Tillam had a popular dance band and played in parish halls, etc, in the war period. Molly Jones, another member of St James, played the piano and Marie Hill occasionally sang in the band. The Graves Commission reports that he was 21 years old and died on 25/03/44, a Royal Air Force Volunteer Reserve sergeant. He is buried at Hoogeveen (Hollandscheveld) General Cemetery.